Ruthie, seems like we barely knew you, though we lived within a couple blocks of each other for thirty-something years. You regularly zoomed by us on roller skates, wearing a wedding veil, holding a big white duck and a rolled up poster of you roller skating, wearing a wedding veil, and holding a big white duck. You were existential infinity in motion. 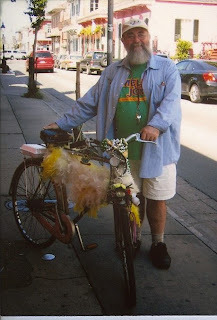 Sometimes you spoke as we pedaled past on Featherbike, our yellow-feather-trimmed bicycle. Once we rode a gleaming French Motobécane, a bicycle we took with us to Sea, when we wore a younger man's clothes. That French bike was stolen by a newly released ex-con you said you knew and hated. He noticed our casual, below Canal Street, lifestyle and jumped over the fence and plucked our Motobécane and its collage of travel stickers. We mourned those stickers -- an irreplaceable collection -- more than the bicycle. You said, "Get a duck. I got a duck. Ain't nobody ever stole no duck." Maybe, though sometimes they ran them over. When dumpy, comical Featherbike replaced that elegant French Motobécane, Ruthie looked at its boisterous yellow feathers, and said, "Looks like Bigbird." "You ought to know, Ruthie," we said. "Don't they call you the Duck Lady?" Ruthie sometimes sat on her stoop, a traditional Downtown pastime, watching clouds ("gathering cotton"), contemplating the weather, Life and, maybe, her next Budweiser and Kool Cigarette. "You got a little beer, for later? A little cigarette, for later" was Ruthie's way of offering to accept a beer and cigarette, but not that she expected to return the favor. 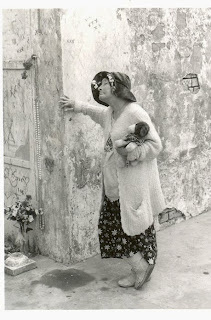 Ruthie was a no-strings, free citizen of the French Quarter, a neighborhood long associated with free spirits. She also enjoyed sitting atop bar stools. 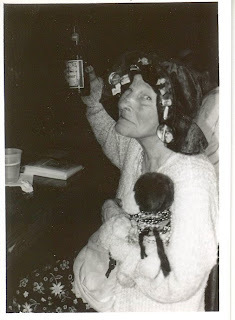 Pat O'Brien's, on Saint Peter, and Crazy Shirley's, on Bourbon, were two of her favorites. We met for the first time at Crazy Shirley's. It was that era when the fabled Sixties were morphing into the Seventies. Our best friend from college was a reporter for the Associated Press newly assigned to New Orleans. I came to visit from Illinois, and spent an early Spring exploring the French Quarter. One day I walked through a magical barroom door and there sat Ruthie and a big white duck. She accepted a beer from the bartender. Complete with a saucer for the duck. She got "a little cigarette, for later" from a man, in a white-and-red striped shirt, standing just outside the barroom door selling Lucky Dogs. He also gave Ruthie's duck a piece of hot dog bun. 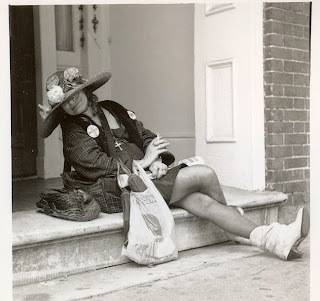 At dinner, that night, my reporter friend told me the story of Ruthie, the Duck Lady -- a proud marcher in New Orleans passing parade. After hearing that how could anyone want to live anywhere else? Within the year I signed up and moved in, next to Ruthie's world. Ruthie had a voice like Donald Duck's Cajun cousin. She was born Ruth Grace Moulon, at Big Charity Hospital, in New Orleans, of parents from Plaquamines, a small town West of the Mississippi River, near Baton Rouge. As a child she was sickly and lonely. As an adult she was not. She died at seventy-four, September 6, 2008, from cancer, in Our Lady of the Lake, a residential care facility in Baton Rouge, where she had been evacuated for Hurricane Gustav. Ruthie gained her four-score-and-more years drinking like a fish, smoking like a chimney, cursing like a sailor, staying out on the streets all hours of the night and day, subsisting on a diet primarily of salt, sugar and preservatives washed down with Budweiser and smoke. Many are the pure fallen to an earlier grave. Ruthie befriended most people, and all ducks. Easter was a big day on her liturgical calender. Many ducklings began their relationship with Ruthie as an Easter offering from friends and tourists who passed the little balls of fluff into her welcoming hands, in Jackson Square, in front of Saint Louis Cathedral. 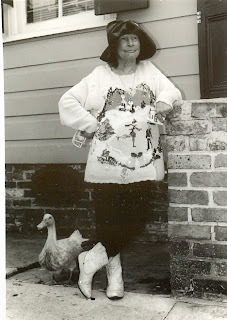 She lived a careless life, and so did her ducks. None of them lasted as long as she did. Most did not make it to the next Spring. But they all seemed happier for the company. Any one who knew Ruthie knew some colorful version of her car-smashed-duck story. They all ended with Ms. Ruthie bending over the carcass in the street telling the fallen fowl to stay on the sidewalk, next time. The sweetest version came from her friend, David Michel, a New Orleans Police Officer who was working off-duty detail, at Pat O'Brien's, when informed Ruthie's last duck had been flattened by an automobile, outside, on the corner. He immediately dispatched a driver to City Park to scoop up a replacement. We sometimes drank beer with Ruthie. And laughed with her. And, truth be told, at her. She was amusing, and -- dare we say it -- an odd duck we are better for knowing. We met her boyfriend, Gary Moody, after we had all grown older, and she had moved Uptown, to the Saint Charles Health Care facility. It was from there she was evacuated to Baton Rouge. Gary Moody had been a sailor on shore leave, in 1963. They met once, on Bourbon Street, and kept up a lifetime postcard correspondence. Ruthie referred to him all the rest of her life as her boyfriend and, sometimes, her husband. Many felt she had made him up. 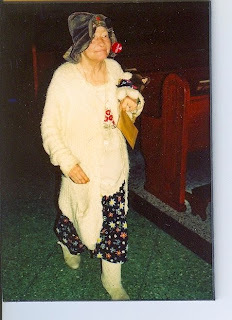 Until he flew down from Minnesota to dance at her sixty-seventh birthday party, at Rock ‘N’ Bowl, on January 20, 2000. The party was organized by friends as dear as any on this side of Judgement Day. 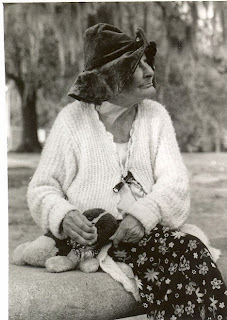 Filmmaker and friend, Rick Delaup, has an excellent film of Ruthie, in a collection of filmographs he has done of free souls of old New Orleans. 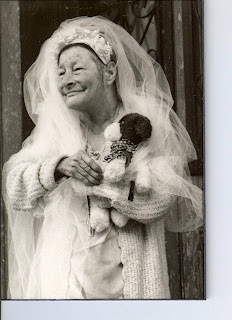 There you may again see Ruthie, her small body bent over roller skates, flying down Bourbon Street, wedding veil flying, a soul mate of a white duck cradled in her arms. Once, my Mother, a stern Illinois-German, came to visit. On a walking tour of the French Quarter, we happened upon Ruthie, who asked for a little cigarette for later, then skated off. My Mother listened to the story of Ruthie's admirable self reliance, and neighborhood colorization. Then said, "Someone should pick her up and put her in a home, where she can be taken care of." The week after that visit, we saw Ruthie walking along Conti with a briefcase-bearing woman in a severe black suit. "A state social worker," I thought, "my Mother dropped a nickel on Ruthie!" Later that same day, we again spotted Ruthie sitting at the bar at Crazy Shirley's. Over a beer we asked, "Ruthie, who was that woman we saw you with, earlier today?" 'What, who?" she said in her Donald Duck accent. "I don't know who. Some woman in a black suit with a briefcase. You were crossing Conti, at Royal." "Naw," she said, "must have been someone who looked like me." The bartender and two flies at the trough laughed. Ruthie smiled her flap jaw snaggle-toothed grin, and lifted her beer. How we could use that laugh again today. Ever since Hurricanes Katrina and Rita gave a one-two near-death blow to our Paris of the Swamps, we have walked her battered streets remembering friends who have gone before. Friends who once lived here, above that shop, and there, beside that bar. We wonder where they are now. And do they know? We pass Ruthie's old place. She lived next to 1313 Dauphine, an address that once belonged to Clay Shaw, the man New Orleans District Attorney, Jim Garrison, accused of conspiracy to murder John F. Kennedy. Both Shaw and Garrison are long gone to their reward. Do they sit somewhere in The Beyond chewing over who killed JFK? We wonder if any one has told them about The Hurricanes of '05? Oh, God, in your ultimate good humor, please let it be Ruthie who brings them the word. L. A. Norma crushed her cigarette on the kitchen dormer's ledge and dribbled the last of her coffee over the scar. "Coffee, best damn restoration there is." She pulled the window closed, and led us down the stairs of Squalor Heights, Faubourg Marigny, New Orleans. It was a new day in old New Orleans, in 2005. Our plans were to heel and toe it into the nearby-faraway French Quarter and eyeball addresses that might have been, "That house in New Or-leens they called The Rising Sun . . . "
We first learned about the Rising Sun, in the fabled Sixties, from a folk song recorded by Eric Burdon (Animals). The song created a musical Mecca during our college daze. A sort of classroom dream-escape that led Illinois college boys to drive to New Orleans for a randy weekend in search of. . .
After diligent research and a ten-cent martini lunch at Bacco, on Chartres, our leg work netted three addresses with possible connections to the House of the Rising Sun. The staid Historic New Orleans Collection owned one of them, at 535-37 rue Conti. It is today a fine and proper exhibition hall and storage annex to the Collection's Williams Research Center, also on rue Chartres. This building is the cause for much of the current speculation about ". . . that house in New Orleans." The Williams Research Center was an experience like college might have been for those who actually attended their classes. Hard-but-comfy straight-backed wooden chairs sat around well lighted tables, inside a room quiet, clean and serene. Save for the occasional lanky loon bobbing about and bumping into the furniture while in pursuit of his own elusive truths. Such are the secondary rewards of library visits every where. "Must you make such a racket?" L. A. Norma asked. The lanky youth glared back at her and said, "Yes." The Williams Center's Pamela D. Arceneaux assured us, with the firm voice of a research librarian, "No ironclad evidence existed of any such Rising Sun ever existing. " "Not as she would ever know," Norma whispered, with a slight down turn of her eyes and nose. Arceneaux had been quoted on this very subject in many recent books and magazine articles. Because? During the annexe's renovation a multitude of rouge pots and wine bottles were found to have been discarded under the building over the past few hundred years. Naive drylanders writing in distant publications concluded these were indications of a certain joie de la vie in old New Orleans. "I have made a study of the history of prostitution in New Orleans and have often confronted the perennial question, 'Where is the House of the Rising Sun?' without finding a satisfactory answer. "Although it is generally assumed that the singer is referring to a brothel, there is actually nothing in the lyrics that indicate that the 'house' is a brothel. Many knowledgeable persons have conjectured that a better case can be made for either a gambling hall or a prison; however, to paraphrase Freud: sometimes lyrics are just lyrics." Not to mention that one would likely find discarded pots and bottles under any building in New Orleans. The second site we found named Rising Sun was an 1800's coffee house, at #9 Old Levee Street -- now 115 Decatur. From my own personal experience, as a Son of the Sea (more than a century and a half later), I am inclined to place a small bet on this upper Decatur neighborhood being the site. "It would surely have held similarities to Decatur Street, today," Norma said, as she placed her Camel Cigarette back in its package. The third site was at 826-32 rue Saint Louis. It is listed in BIZARRE NEW ORLEANS, by Frank G. Fox, as having been owned, from 1862 to 1874, by a Marianne LeSoleil Levant -- a name that loosely translates from French to English as, "Rising Sun." Maybe. But my money stays on the coffee shop at 115 Decatur. The new annex was destroyed by fire in 1822, but had been a hotel by the name of House of the Rising Sun, for the preceding thirteen months. It was a parking garage when purchased by the Historic New Orleans Collection, in 1992. History can be a fickle pickle and no more confirming evidence than that exists as to where -- or even if -- such a house existed. "Several of them always exist," Norma said, as we stepped out onto Chartres. She lit a Camel, and added through its smoke plum, "Ask Senator David Vitter, Republican from Louisiana!"